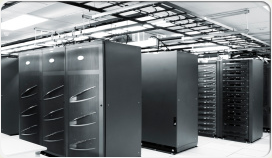 HostedFX operates in the most efficient Tier IV datacenter in North America Scherermen Datacenter is located in the heart of Columbus, Ohio and features full redundancy 2 (N+1) . The datacenter includes 5-acres and 2 telecom buildings, all located at the geographic high-point of Franklin County. All our servers are fully placed in a secure cage (Full Compliance see below for details) HostedFX operates with its own technology , equipped with its own cages, network setup server components , and racks. Our competitive prices gives you the best hosted environment for your server. Tier 4 datacenter are rare in the business (only few located in the world) the setup gives the best outcome to your server performance and our network backbones gives your server stability and expandable full time. Whole State Crossing With 5 Providers. 24 Hours emergency response team. Single U or Full rack managed solutions. HostedFX advance senior datacenter admins will manage your collocated servers at an affordable price. Sent your servers to obtain the space in our datacenter. We will set it up and provide basic support for the server. Full datacenter communication is open 24 hrs.